The old saying goes "A picture is worth a thousand words", but what if the picture is of a thousand words? What do you do then?!? Huh, Barlett?!? Well, you sell them, under the moniker Lionword Illustrations. 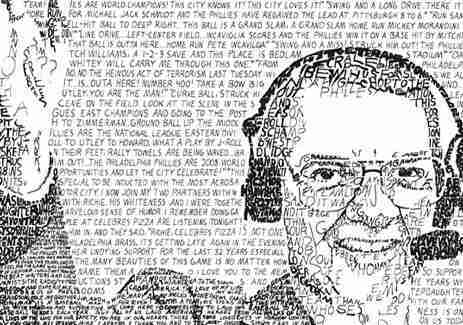 Lion's a series of totally unique sports vignettes and historical portraits rendered entirely from handwritten copies of career statistics/famous speeches, produced by a Philly man with a degree from the Hussian School of Art (not to be confused with the Russian School of Art, where art schools YOU!). 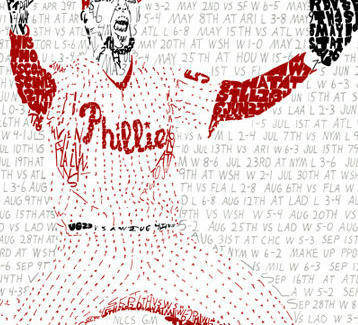 Sporty works include a portrait of Brad Lidge making his last meaningful save closing out the '08 Series (created from the Phils' win-loss record from the regular/post season), a capture of Andre Dawson made from his career stats, and a tribute to Harry Kalas comprised of his greatest calls and Hall of Fame speech -- which, due to the artist's inability to do much with "You're with me, leather" and "Canadian aspirin with a little bit of Codeine in it, just enough to give you that pop", probably won't work for Chris Berman. Moving to apparently "more-serious" political subject matter, there's MLK captured in his "I Have A Dream" speech, an Obama done from his inaugural address, and a pic of Lincoln from the 1864 inaugural address, drawn with malice towards none, with charity for all, and with firmness making up the bulk of the man's goatee. As future pieces're decided by polls on the site, right now visitors can choose whether they want to see JFK's inaugural or FDR's Pearl Harbor speech depicted, or if the first football portrait should be Dawkins, Westbrook, or Barry Sanders, who seems to be the obvious choice, as everyone knows a picture is worth a thousand swerves.